Nobody panic, but I'm pretty sure there's been a glitch in the matrix. My calendar insists it's 2019, y'see, but my brain is fairly certain that can't be possible. I mean, c'mon: Did another year somehow slip by us already? Has my holiday hibernation time actually come to an end? Are we really, truly at the start of a whole new orbit around that hot, boastful sun of ours? Truth be told, I'm pretty skeptical — but until I wake up and determine this is a dream, I reckon we oughta go ahead and act like a new year has begun. And that means it's time to think ahead to the themes and trends we're likely to see taking shape here in the land o' Android over these next 12 months. 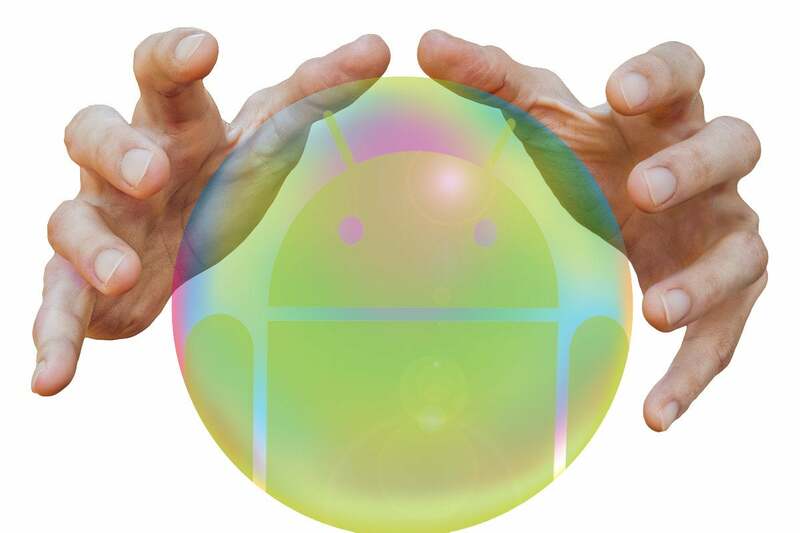 Trends tell us plenty about the bigger picture of where things are moving and why, after all — and while we certainly can't say anything for sure (well, except for one thing), it seems awfully likely that these themes will dominate the Android discussion for the 50-some-odd weeks ahead. Our first trend is something we saw starting to shape up in 2018, and it's poised to become even more prominent this year: the notion that the virtual assistant is the true connective tissue in our mobile tech lives — a layer more significant than the specific device or even operating system you're using at any given moment. Google's entire business revolves around the notion of online ads. Everything it does — including, yes, the sales of Android phones — ultimately serves to reinforce that business. But as people spend less time surfing the open web and more time using apps and connected devices, the future of the online ad industry is being threatened by irrelevance. Google Assistant, on the other hand, is designed to be everywhere. It's on your phone, yes, but it's also on its way to your TV, your headphones, and every inch of your home via a variety of smart speakers and displays. It and its rivals are rapidly making their way into businesses and the enterprise. ... It's no stretch to think of Assistant as the next-gen version of that classic Google search box — a version that isn't stuck on your screen but instead follows you everywhere and works with or without a visual accompaniment. That final sentence (bolding added for emphasis here) tells you everything you need to know: The future is less about a traditional box-on-a-page web search and more about interacting with the stuff around you — whether it's your phone, your laptop, or a random object in your office or home. And guess what? If Google Assistant is the jolly ol' genie inside, using it ensures you're still an active Google customer. With that reality in mind, expect to see plenty more emphasis on Assistant within Google's own gadgets and in a growing number of other places. The company's presence at this week's CES circus in Vegas says it all: The Assistant launch phrase "Hey, Google" is plastered everywhere imaginable, a gigantic "Assistant Playground" booth is set up to show off "Friends of Assistant" devices along with an Assistant-powered ride (?! ), and an almost comical range of Assistant-enabled devices is debuting — everything from the now-typical-seeming lineup of talking TVs and headphones to an Assistant-centric "water-jet-resistant" smart screen for your kitchen (uh huh), an Assistant-compatible pressure cooker (yuuup), and an Assistant-packing smart-mirror/pants-steamer combo (totally not kidding). Get ready for a heck of lot more Assistant this year — both in places you want it and maybe in a few where you don't. Google isn't the only mobile tech player to sense the value of creating its own A.I.-centric ecosystem — and it's no wonder: The virtual assistant market is still an immature, wide-open race, and whoever manages to create the de facto standard will find themselves in an enviable position. There's a reason Google's better at this game than everyone else, though: It has a level of reach and a range of data that give it an unmatched advantage in being able to find and provide useful information. Whether we're talking about personal info — details about trips, purchases, and shipments from your Gmail or info about upcoming events from your Google Calendar — or more generalized facts and knowledge (y'know, all the stuff indexed and instantly accessible by that little ol' thing called Google Search), Google is uniquely positioned to create a virtual assistant that's actually able to assist you in some pretty powerful ways. That's why, within the realm of Android, pretty much every attempt to create a competing A.I. assistant is laughably bad (here's lookin' at you, Bixby). Each of those efforts feels like a watered-down, less powerful, and generally pointless version of Google's own Assistant offering. But don't expect those companies to give up the dream just yet. Samsung is still pushing to put Bixby everywhere imaginable, LG is still trying to convince itself "ThinQ" is a thing anyone cares about (or knows how to say), and practically every other Android-connected company is cookin' up some new way to get its attempt at A.I. software in front of your overloaded fingers. They're all bound to remain mediocre at best, but they'll almost certainly remain talking points and poorly attempted areas of "differentiation" over this coming year. What's a phone? What's a laptop? How 'bout a Smart Display? Or tablet? As we usher in the start of 2019, the lines between all these device forms are getting increasingly blurry — and the designations themselves are feeling more arbitrary than ever. As it stands right now, you might have a laptop that technically runs Chrome OS but looks and acts an awful lot like Android, supports Android apps, and converts into a tablet by way of a swivel or detach. At the same time, you might have a Home Hub that acts like a physical manifestation of your Google Assistant, looks kinda like a tablet mounted on a stand, and runs some weird operating system built on Google's Cast platform (software that, by the way, looks and acts exactly like a different Google-made Smart Display operating system that's built on Android). It's enough to make even the most enthusiastic enthusiast's head spin. How could any average Joe possibly keep track of all of this? The answer: He couldn't. And that's kinda the point. Google doesn't want you to think about what type of device or operating system you're using anymore; it just wants you to have whatever you need to stay connected to your Google-centric stuff wherever you are and whatever you're doing. If that means a phone in your pocket to check email on the go, cool. If it means a laptop in your bag to type out documents on the road, swell. If it means a Smart Display at your desk to make calls and manage your agenda, so be it. The days of firmly drawn lines between device types and platforms are essentially over. Google's interfaces are only going to get more aligned and complementary in the months ahead — and the designations of what specific type of product or platform you're using are only going to shrink in significance. Look, let's face it: Despite all the trends we just talked about, hardware manufacturers still have to sell hardware — and carriers have to keep coming up with reasons to convince you to drop more dough. With that in mind, we can expect to see tons of silly hype about 5G in 2019 along with a fresh set of meaningless but marketing-friendly metrics for upcoming phones. Take, for instance, the next great silly smartphone superlative: the number of cameras packed into a flagship. You and I may know that a phone's camera count has little to do with the quality of the images it's capable of capturing, but that isn't stopping the Samsungs and LGs of the world from jamming as many lenses as possible into their phones and then using that figure to encourage customers to upgrade — because, hey, if this new phone has five cameras and that other one only has two, surely this one must be better, right? At its core, the tactic is no different than the silly smartphone superlatives of years past — the biggest, the smallest, the thinnest, the brightest, the most pixel-packing, the least bezel-showing, and the most megapixel-injected devices. All those qualities made for ad-ready bragging rights despite offering little in the way of real-world value, and the coming camera craze will generally be no different. Some manufacturers are even turning back to the memory game, with devices featuring wildly excessive amounts of RAM — 10GB, 12GB, you name it — for no apparent reason other than being able to say that they do. 2019 appears to be the year the long-fabled folding phone will make its debut — but, as usual with this sort of hardware gimmick, it remains unclear what practical value the form will bring to us as users, not to mention what types of compromises it'll require. To wit: Will having a foldable screen really provide a meaningfully better experience than having a phone with a large display, as so many of us already do? What about the screen durability, the inherent heft and clunkiness involved with such a form, or the inevitable issues with actually getting developers to implement effective app support for that arrangement? One thing we do know is that these first foldable phones will likely cost a pretty penny. An early foldable phone from a company called Royole runs $1,300, while recent estimates suggest Samsung's heavily hyped effort could set you back somewhere in the range of $1,800. Ouch. It also seems to safe to say, for now at least, that the foldable phone will join the ranks of the slider phone, the pop-up camera phone, and other mobile tech innovations that seem impressive from engineering standpoints but that bring to mind the ticker-display phone, the self-healing phone, and the dual display phone of yesteryear — all of which also packed plenty of "wow" in their moments but failed to provide any lasting real-world value. Nevertheless, brace yourself for countless breathless headlines over these "next big things" in 2019. You've been warned. If 2018 was the year of the notch, 2019 is poised to be the year of the alt-notch — the creative new take on working a cutout into a device's display. The goal, as you probably know by now, is to leave space for cameras and sensors and other such elements while still allowing for a minimal amount of bezel around the screen (though a wise and extraordinarily handsome prophet once pointed out to me that a notch itself is in fact a type of bezel — a particularly prominent and distracting one, at that). Instead of the standard boxy top-center notch, Android phones this year are expected to explore arrangements like the "waterdrop" or "teardrop" notch (hi, Essential Phone! ), the "hole-punch" or "O" notch (oh, yes), and even the dual notch (because clearly, two notches are better than one, right?). A notch may ultimately be little more than a clumsy and inelegant short-term workaround — a means to an end that can't quite be achieved without that level of trickery just yet — but all signs suggest we've got more awkward fumbling to go. Those last three trends are all side effects of a deeper reality in the mobile tech world: Phone hardware itself just isn't all that exciting anymore. As we've discussed plenty over the past few years, the most meaningful progressions nowadays are largely software-driven — and, especially if you choose a device that receives ongoing upgrades for an extended period of time, there's very little reason to buy a new phone every year at this point. The right device can easily last you two or even three years without making you feel like you're missing out on anything of great consequence. Perhaps not surprisingly, then, people are sticking with their phones for longer than ever, according to a combination of research, widely observed anecdotal evidence, and good ol' common sense. That, in turn, has some of the world's biggest device-makers struggling to meet sales expectations. So, here we go again: Hardware manufacturers still have to sell hardware if they want to stay in business. (Google is pretty much the sole exception to that rule, and — well, it shows.) That means they'll do whatever they can to make each new generation of device seem different enough from the last to command attention — and it also means they'll respond to slowing sales by charging you more for each new model. If you won't buy a new phone every year, damn it, you'll shell out extra shekels whenever you do decide to upgrade. One way or another, the folks making the phones have to make money. We've seen prices at the high-end and even midrange level of the smartphone spectrum rise steadily over the past couple years, and the smart money says that's a trend unlikely to slow down anytime soon. Already, thousand-dollar phones don't seem so shocking. And those devices didn't even have any transformational-seeming technologies involved — other than a dash of "magical" marketing, of course. Throw in the presence of 5G, foldable screens, and other shiny new additions, and it's easy to see where things are headed. The good news: You're ahead of almost everyone else — because guess what? You're keenly aware of all this stuff, and that means you can evaluate things for yourself in a level-headed manner and without undue influence from the internet hype machine. Awareness is the secret ingredient to smart decision-making in the realm of mobile tech (and pretty much everywhere else in life, for that matter). No matter how much context we may have about the themes ahead of us, though, trends are not blueprints — and you can bet we'll run into plenty of eye-opening surprises in the year ahead. This collection is but a general guide to get our heads in the right places; the actual map will draw itself bit by bit, day by day. So buckle up and hang on tight: This next leg of our journey is just getting started, and we're sure to have another wild ride ahead.